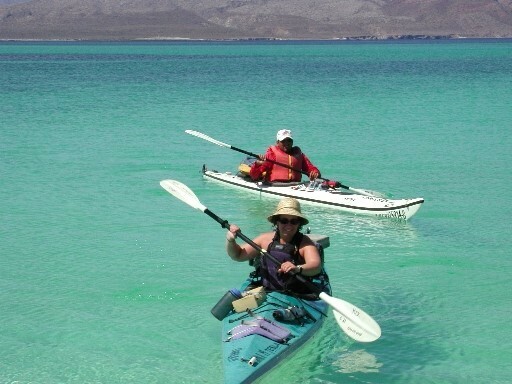 What better way to spend a winter holiday than enjoying the wonders of Baja’s Sea of Cortez by Sea Kayak. Imagine yourself dining on a white sandy beach while gazing out at 6000ft mountains. Explore the uninhabited islands in the Sea of Cortez! You will discover biodiversity at its finest in this rich marine ecosystem in the Bahia de Loreto National Marine Park and UNESCO World Heritage Site. Jacques Cousteau described the Sea of Cortez as the “world’s aquarium” and the “Galapagos of North America”. Come join us, see for yourself! Dolphins, Blue, humpback and fin whales, sea lions, Orkas and numerous sea birds are just some of the wonders to be had. We ran our first Baja Trip in 1997 and have run dozens and dozens since that first trip on a variety of different routes. This trip will be a fantastic 7 day island route, similar to one of the very 1st trips we ran. On this route we’ll explore some of Baja’s finest island scenery off Loreto in Baja California Sur. For 7 days we are overlooked by an enormous and spectacular mountain range, the Sierra de la Giganta; in many places as sheer cliffs hundreds of feet high, it plunges directly into the Gulf. Rust red volcanic rock formations provide intricate caves and arches to explore and canyon lands that beckon the intrepid. The beaches are extraordinarily beautiful with fine soft white sand and many have canyons behind which we can explore on foot. This area has a very low amount of seafaring traffic but an amazing amount of marine activity. We often have daily dolphin sightings, perhaps whales or sea lions. The pristine snorkeling areas are abundant. We nearly always indulge in fresh fish and lobster so feel free to bring your own fishing line and help catch dinner! We’ve been running a variant of this trip for, many years. Long a favorite of guides and clients alike. We spend 6 days exploring the sea of Cortez and islands off of Loreto. This is a relaxed pace trip with only about a half day of paddling on most days so you’ll be able to relax at the campsite or explore the surrounding area by kayak or foot. We’ll visit Isla Danzante and Isla Carmen as well as a section of the coast south of Porto Escondido. Spectacular white sandy beaches, great snorkeling, stunning mountains. MEETING DAY: You must arrive in Loreto at least the day before the 1st paddling day. The group meets for breakfast on Sunday March 24th at the Café Ole for food shopping and orientation. More than half our clients arrive 1 or 2 days before this meeting day and check into a hotel. This allows for a more relaxing holiday. It also helps eliminate the risk of your baggage not coming on the trip with you. Shopping will only take a couple of hours and then perhaps for the evening we’ll all go out for dinner. In the morning we will board the taxis early after breakfast and head south to Escondido. DAY 2 (March 25). We meet early and board the taxis for the driver south to a lovely beach just south of Porto Escondido. The first day will set the pattern for the trip as we make our way south along the rugged Sea of Cortez coastline south of Escondido. We’ll paddle for about 2hrs south past the first large point where we will put in to a beautiful and secluded beach and spend the afternoon and evening. There will be opportunities here to swim, hike to a spectacular rugged overlook or simply relax on the beach. Dolphins and sea lions are likely to be seen perhaps even whales. This holds true for much of the trip. Day 3:(26) Today we’ll head north and across to Isle Danazante, a brief stop here for some sightseeing, swimming or hiking and then we’ll make the 45 minute crossing to Isle Carman were we will set up on one of the many spectacular beaches on the south end of the island. Day 5: (28) Today we’ll stay camped on Carmen. Wind permitting we’ll explore farther up the rugged east coast of the island. Swimming, snorkeling, hiking etc will also be in order. Day 6 (29) On Day 6 we’ll go south and head back across to Isle Danzante. Day 7 (March 30th) In the morning we’ll head from Danzante across the channel to Baja mainland for a mid day pick up. From here it is a relatively short drive back to Loreto. Trip price includes: Certified, bi-lingual naturalist guides. Single and/or double kayaks, all kayaking gear, cook gear and group gear, transportation to and from your Loreto hotel to start and finish of trip. Trip food costs, shopping and prep are shared by the group. Guests are responsible for bringing their own sleeping bags & tents. Tents, Snorkel sets, wetsuits may be rented. Limited availability book in advance. Accommodation: You are responsible for hotel accommodations/meals pre and post trip in Loreto. * Please note: It’s the nature of remote travel that uncontrollable factors like poor weather, pilot judgment, forest fires, and mechanical problems can affect our schedules and cause delays. We regret these situations but cannot accept responsibility for hotels, flight rebookings, and other costs you may incur. Remember you are responsible for your own food and accommodations in Loreto. Bring sunscreen! Sunshine with pleasant temperatures ranging from 20 to 30 Celsius is the norm. In March it starts getting even warmer. Rain is virtually unheard of in the sping. Because this is a desert environment the evenings it can be cool, perfect for camping, hot in the day, cool at night. As such a two or three season sleeping bag is not a bad idea (by March 2 season is usually adequate). Water is warm, not hot. Some people bring a thin wet suit so they can say in the water for longer periods of time to snorkel. Sometimes the wind can blow strongly. On these days, we paddle sheltered waters or partake in land activities. We will be paddling predominantly single fiberglass kayaks but will always have one or two doubles on each trip (Arluk Ills, Teslas, Solstice Gts, Nimbus). No kayaking experience is necessary, though we insist that you know how to swim and have a good level of fitness. We supply dry bags, and all cooking and eating equipment. We encourage you to bring snorkeling and fishing gear if you have it. You provide your own personal camping items, and your own tent. Our safety equipment includes paddle floats and flare guns for each kayak a first and kit and VHF marine radio. 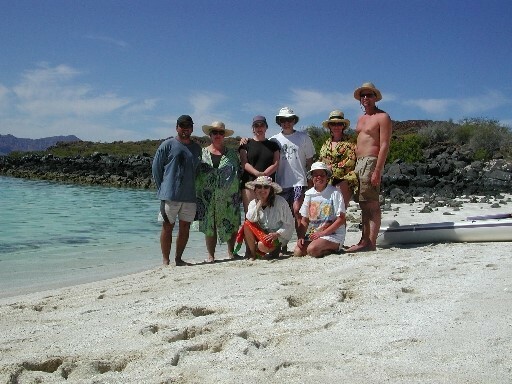 This trips starts and finishes in Loreto, a small coastal community 950 km south of the US border on the Sea of Cortez. Loreto was once the capital of the Spanish ruled state of California, it is the oldest settlement in Baja and is now a quiet and pleasant town. Flights into Loreto are offered almost everyday thru the USA. Direct fligths from Canada are very limited, only West Jet flies direct on Saturdays. If you have more time you can try and take advantage of cheap charters into San Jose del Cabo at the southern tip of the Baja peninsula. (8 hr bus ride to Loreto from San Jose del Cabo). A visa is not necessary, though a Mexican Tourist Card is. They can be obtained from your travel agent, airline or a Mexican consulate. Don’t forget your passport. It is best to bring American dollars or travelers cheques in small denominations ($20). Us dollars are accepted just about everywhere in Baja. Don’t bring Canadian dollars. A few places take credit cards, many do not. Bank cards can not be used.